The wedding cake is an important part of any wedding celebration. It provides a beautiful centrepiece for your reception, and a stunning photo opportunity for your guests as you cut the wedding cake. Here at Confetti Cakes we have over ten years experience creating the perfect wedding cake for your special day. We believe in creating exquisite wedding cakes at sensible prices. We cover a wide area including Gloucestershire, Herefordshire and Worcestershire. Prices include local delivery up to 10 miles from Tewkesbury, a small charge will be made for deliveries outside this area. Alternatively, you can collect your wedding cake. Let Confetti Cakes help you to have the wedding cake of your dreams. You can browse through our portfolio, or you may have your owns ideas or suggestions. 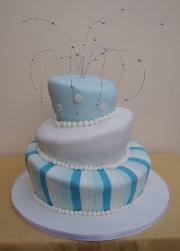 Each wedding cake is made to order, with your requirements in mind. From a traditional wedding cake to a luxury belgian chocolate wedding cake, or even a tower of fairy cakes, the choice is yours. We provide a free no-obligation consultation, working carefully to ensure you receive the wedding cake of your dreams that is as unique as you are. 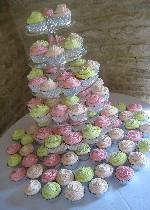 Prices start from £170 for a two tier wedding cake and from £220 for a three tier wedding cake.